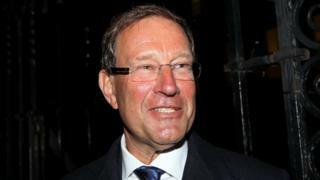 Richard Desmond, the owner of the Daily and Sunday Express newspapers, plans to bid for the right to run the National Lottery when it comes up for renewal. The plans by Mr Desmond, who runs the Health Lottery, have been reported in the Financial Times. Camelot has held the UK's lottery franchise since it was set up in 1994. A challenge to its monopoly would be the first since Sir Richard Branson's Virgin Group failed to win the franchise in 2000. Camelot has the right to run the National Lottery until 2023 - after securing a four-year extension to its contract in 2012. It expected the franchise renewal process will begin in 2019. A bid would be made through Mr Desmond's company, Northern and Shell, which owns his newspaper and magazine titles. He has run the loss-making Health Lottery since 2011. It is not a national lottery but a collection of 51 local society lotteries that raise funds for health-related good causes. However, they collectively pay out less in winnings than the National Lottery. Camelot failed in a 2012 High Court bid to have the Gambling Commission's licence for the Health Lottery revoked. Martin Ellice, joint managing director of Northern and Shell, told the FT the company would make a bid, saying: "We're in the lottery business now." Mr Desmond sold Channel 5 to Viacom, the MTV and Nickelodeon owner, for £450m in 2014 and is in talks with the Mirror Group to sell the Express and Star titles. Ontario Teachers' Pension Plan, one of Canada's biggest pension funds, bought Camelot for £389m in 2010. Northern and Shell is expected to highlight its UK ownership in its bid. Paul Ashford, the company's group editorial director, told the FT: "The British people would not mind a British company doing the British lottery." Earlier this year Camelot announced a strategic review after ticket sales fell by 8.8% to just under £7.6bn for the 12 months to 31 March. Camelot has argued that greater competition would reduce the share of ticket sales that go to winners, good causes and in tax. That figure stood at 95%, the company said. The National Lottery has awarded more than £63bn in prize money, making some 4,600 people millionaires. Camelot declined to comment further. Northern and Shell could not be reached by the BBC. The BBC broadcast the Saturday National Lottery draws on BBC One until January this year, but now shows them on iPlayer. The National Lottery Awards, which recognises recipients of National Lottery Good Causes funding, will continue to be shown on BBC One.